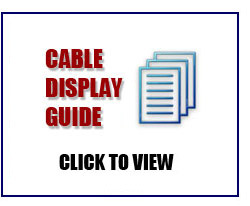 Freestanding Cable displays have all the flexibility of a cable-display system with the added benefit that there is no need to fix them to you building. This allows you to position the freestanding display where you want and any time you reorganize your store simply push it into a new position. Freestanding cable displays can display literature racks and posters holders or a combination of both just like our cable display equipment. Supplied flat packed these display stands only take a few minutes to put up.